Should Facebook Inc. Open Up Its User Data for the Greater Good? No other company has as deep a well of information that can help researchers in their quest to understand people and perhaps remedy society's ills. Last spring, Facebook (NASDAQ:FB) began limiting access to user data that the company had previously shared with outside parties. This decision has reportedly been rough on app developers, whose plans were based on open access to Facebook's so-called "social graph" and other information, as well as on political parties and organizations who tapped Facebook's data to reach out to potential voters and nudge them toward the polls. You probably won't hear any Facebook users complaining about this decision. It was due to user concerns that Facebook made the move to restrict access in May. But there's one area where the company should consider keeping its user data open: academic research. If a recent Wall Street Journal report [subscription required] is indicative of a big picture, those researchers may be finding themselves shut out from information that had been available for their studies. WSJ's report highlighted the case of Dartmouth social psychologist Benjamin Crosier, who is researching links between social-media activity and problems such as drug addiction. Crosier, who had hoped to build an app, was denied access to the Facebook data he was using earlier this year and is now petitioning the social network, hoping he can resume his efforts. His case underscores the delicate balance Facebook must strike as it on one hand carries out its mission "to give people the power to share and make the world more open and connected," and on the other looks to turn each of its nearly 1.5 billion users into an increasingly larger pile of cash that drops to its bottom line – and, ultimately, its shareholders' brokerage accounts. Facebook told the WSJ that these third parties can still access data from the social network, but that the new rules "simply require them to do so in a more privacy-protective way." But what Crozier is experiencing now, academic researchers were fearing a year ago, when Facebook first announced changes in access were on the way. "[Some of] the biggest scientific studies ever run were Facebook studies," Robert Wilson, a PhD student at Washington University, told Mashable last July. "Now I'm kind of worried that it's all going to fall apart because there's this risk." Researchers have been employing Facebook user data for studies since 2007, when the company first announced it was opening up data to third parties. By 2014, there was "basically a new article coming out every day" based at least in part on the data gathered from the social network, Wilson told Mashable. Idealism and capitalism collide ... or do they? As much as this is a dilemma for the company, it's also a dilemma for investors. Using its resources for the greater good of society isn't always the best decision a company can make for shareholder value -- at least not in the short term. But companies have been leveraging seemingly idealistic work into success for some time. We need to look no further than Google (NASDAQ:GOOG) (NASDAQ:GOOGL), the only digital ad seller bigger than Facebook, for an example. Contact lenses that may help control diabetes. Tremor-canceling spoons that may help Parkinson's patients. High-tech, turbine-equipped kites that generate power from wind. None of those help to connect Web users with businesses that have products and services they're interested in buying. And Google's so-called "moonshots" lose the company $8 billion to $9 billion a year, according to Morgan Stanley estimates. But Google co-founder Sergey Brin defended the expensive digressions in an SEC filing in July, arguing that shareholders must view Google as a research-and-development company, and not just an ad seller. "We shared a profound belief in the power of technology to make life better for people everywhere and imagined what life could be like 10, 15, 20 years down the road," Brin wrote. With its army of engineers, Google is a company that can, indeed, make a difference. And it's been hard to argue with the company's success. 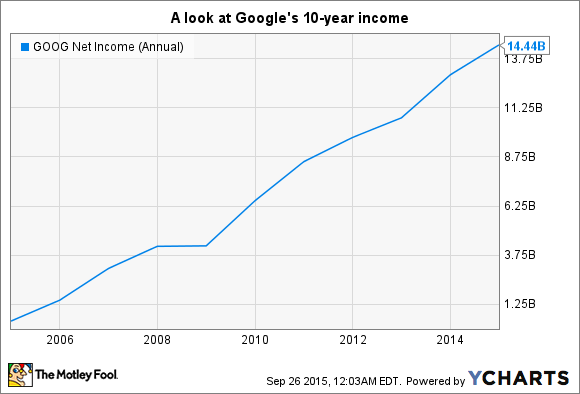 From 2004 to 2014, Google's net income shot from $399 million to more than $14 billion. That's a compound annual growth rate of 43%. And as with Google's deep well of talented engineers, Facebook possesses resources that can help improve society in many ways. Its comprehensive information on more than a billion people is invaluable to researchers trying to understand and find solutions to societal ills. To fully serve its mission, Facebook must find ways to let users tap its greatest resource for the greater good. The question is whether it can do that while serving two other sets of constituents: its users and its shareholders. It has a fine line to walk, and success that's true to the company's mission may depend on whether it can keep its sense of balance under the weight of growing profits.